UK Championship debutant Ashley Hugill says his 6-1 first-round defeat by Shaun Murphy was a valuable lesson in what it takes to be a top player. The York amateur, 21, lost the opening frame to the world number five after one mistake and was soon 3-0 down. Hugill, who was seeded 125th at the York Barbican, told BBC Sport: "I don't feel like I played too badly. "I think that is the best anyone has ever played against me, but that's what top players can do." Hugill did get on the board against the 2008 champion, winning the sixth frame to get back to 5-1 and briefly extend his first appearance at one of snooker's 'Big Three' events. And he is eager to get another chance. "It was a lesson in how to win frames in one visit," Hugill added. "I need to be more clinical but I would love to play in front of big crowds again." Nottingham's Murphy was complimentary about his opponent. "He can definitely play," he said. "But I had a good start with a century and that settled me and let him know I was ready. "I thought some of his potting was very good and his tactical and safety game was strong too. I hope he goes from strength to strength." 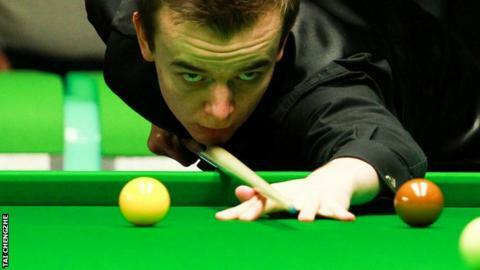 Murphy, who was beaten by 15-year-old Chinese player Yan Bingtao in the Champion of Champions event in Coventry earlier this month, faces another Chinese player - Zhou Yuelong - in round two. The 33-year-old said: "I am chuffed to get through and looking forward to round two. But my record against young Chinese players isn't great in recent weeks."